This article is based on a lecture presented by Professor Orest Subtelny, Friday March 7, 2003 at the Ukrainian Museum in New York City. If you've ever heard snippets of stories about your parents' or grandparents' experiences in the post-war Displaced Persons camps, you would have enjoyed hearing the lecture by historian Orest Subtelny at the Ukrainian Museum in New York. Over the course of an hour and a half offering context and substance Professor Subtelny vividly illustrated what he termed the "mobilized" lifestyle of many Ukrainians who found themselves without a homeland (or home) in Europe at the end of the Second World War. There was no recognized Ukrainian state at the end of WWII, and that fact alone was largely responsible for the drive to establish a distinct Ukrainian presence in the post-war European setting. On the last day of the war in Europe, some 20 million foreigners found themselves stranded in Germany and Austria (students, forced/slave laborers on farms or in factories, death camp inmates, etc.). More than 2 million (roughly 10%) of the foreigners were Ukrainians, and all but 200,000-220,000 of these returned either by force or willingly to what by then was the Ukrainian Soviet Socialist Republic. The majority of those who remained were concentrated in Bavaria in southern Germany. 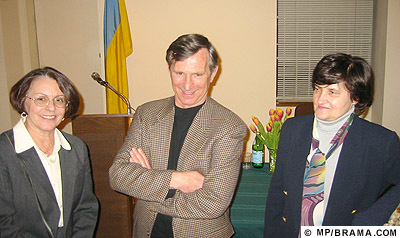 Author and historian Orest Subtelny flanked by his sister Oksana Isajiw (left) and Maria Shust, Director of the Ukrainian Museum. Clustered in what became known as "Displaced Persons (DP) camps", Ukrainians rapidly formed unique self-governing groups and activated numerous cultural and other organizations. The notion of self-supporting cultural organizations (with no objections from the prevailing government) had been conceived during the period of Polish and Austro-Hungarian occupations of Ukrainian territories. Those that were organized in the DP camps later became springboards for organizations that are active today in the Diaspora. The time spent in the DP camps was effectively a "boot camp" for Ukrainians migrating to the West. Prof. Subtelny summed up this effect in his opening remarks: "We [the Ukrainian Diaspora] would not be here if it were not for the DP experience." Post-war Germany and Austria were divided into 4 zones administered by the Allies: United States, Great Britain, Russia (Soviet Union), and France. The majority of the Ukrainian population wound up in the Soviet sector. Although some fled, most were summarily repatriated to Soviet Ukraine by the area administration. Soviet military personnel visited the other sectors to "invite" those it considered its citizens to return home, but met with little success. Those who chose to follow the Soviets were often driven by personal circumstances that were ambiguous and complex. Some had families that they had left behind, some believed that communism would work; others feared the unknown future in the West. Many lived to regret their choices. The story of the post-war Diaspora (literally, "the scattering") in German and Austrian DP camps, which was the subject of the Subtelny lecture, is a fascinating one. Not only is this the story of a generation that is for some of us our grandparents, our parents, or even ourselves, but it is also the story of an experience that is unique in history. Prof. Subtelny argued that it was precisely "because of the DP experience, the Ukrainian Diaspora has maintained its institutions much longer than other ethnic groups (including other waves of Ukrainian immigration) which did not have such an experience." In other words, it cannot be said that that all Ukrainians are naturally "more resistant to assimilation than others," but it is the case "that that those [Ukrainians] who went through the DP camps were more resistant." Why didn't the 200+ thousand return to Ukraine? Primarily for two reasons: 1) Ukrainians were being decimated and/or exiled to Siberia by communist authorities, and 2) property was confiscated and farmers were branded as "kulaks" that were often exiled or executed by the Soviets. Given a choice between the uncertainties of life in a democratic West or the certainty of death or exile at the hands of the communists, Ukrainians chose the former. Who were the Ukrainian DPs? The 200,000+ ethnic Ukrainians who remained in the West were a diverse group coming from all walks of life. 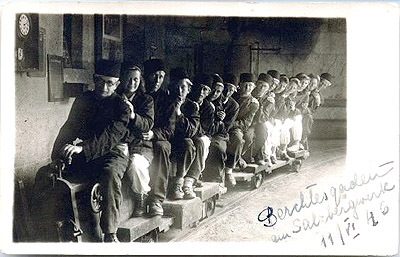 About 120,000 of them were forced laborers brought from Ukraine to work in German and Austrian factories or on farms. The rest were, as Prof. Subtelny put it, an "urbanized, educated intelligentsia." 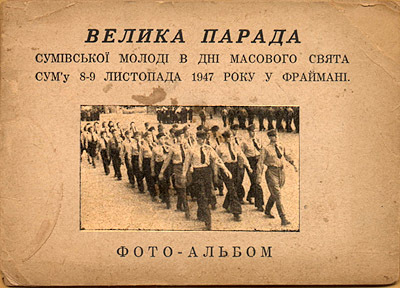 Of this latter group most were Galician political activists with others being East bank Ukrainian activists, all working for an independent Ukraine: Petliurists (followers of Ukraine’s first president, Symon Petliura), Banderites (followers of Stepan Bandera), Melnykites (followers of Andrij Melnyk), Ukrainian monarchists (supporters of Hetman Skoropadsky), and other politically motivated Ukrainians. Further, many were students who had come to Germany or Austria before the war to pursue higher education, while others were family members of the Galicia Division soldiers who fought against the onslaught of the communist armies. After the war the United Nations Relief and Rehabilitation Agency (UNRRA) was deployed throughout Europe for the purpose of restoring order in the ravaged areas. DP facilities were quickly arranged in former German military barracks, labors camps and schools, although UNRRA was surprised to discover that as many as 2 million displaced foreigners remaining in Germany and Austria had no intention of returning to their native lands. Eventually (~1947), UNRRA turned operations over to the International Relief Organization (IRO) which managed the overwhelming task of resettling the DP's. Initially, UNRRA resisted the idea of all-Ukrainian camps, but later relented under pressure from the already organized community leaders. Of 700 DP camps as many as 80 were for Ukrainians. The camps ranged in size from populations as large as 6,000 to as small as 500. 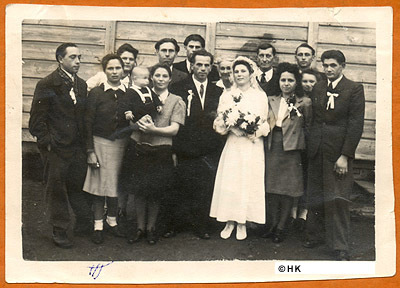 Wedding in a DP camp in Villach, Austria, September 1947. Signs of a "baby boom" that hit the DP camps of post-war Europe. Life quickly took on a societal structure in the camps. Administrators were elected from the camp's population. Schools from the kindergarten to the university levels were established and political parties were organized. Veteran groups, cultural groups (choirs, theatre, dance), sports clubs, women's organizations, professional and trade groups (physicians, engineers, tailors, etc. ), youth groups (Plast, CYM) , cooperatives, and police systems (residents of DP camps were not subject to German law) were among the other institutions that were rapidly organized in the camps. The camp population was relatively young  75% in the 18-35 range. About one-half of the youths joined an organization. 60% of the adult population was involved in at least one organization, and 70% of the women had joined a women's group. Доповідь проф. О. Субтельного ретельно представлляє факти понад півстолітньої давности - історію українських таборів ДіПі в Німеччині й Австрії. Фактаж досить репрезентативний і об'ємистий. Джерела - крім особистого досвіду юнака учасника періоду "таборових республік" - також друковані праці, зокрема капітальна робота д-р В. Маруняка, збірник аналітичних доповідей торонтонського симпозіюму Ukrainians in D.P. Camps та багато збірників про окремі табори. Субтельний представляє вірно і правдиво передісторію таборів, дає політичну і суспілььну картину "ісходу" еміґрації кількох сот тисяч втікачів, насильно вивезених на працю та українських полонених різних воюючих сторін - німців, совєтів та зах. аліянтів. Аналіза різних катеґорій цих людей, їх соціологічна і професійно-освітня характеристика, побутові умови в 1945-50 рр. та організація таборів і таборового життя творять основну канву праці Субтельного. Автор розглядає цей багатий матеріял про майже чвертьмільонну масу українських іміґрантів в рямках певної концепції, яку він розробив слідом інших дослідників (В. Кубйович та ін.). Тут він бачить і ґенезу сучасного поняття "українська діяспора". Вона сформувалася в короткому часі (5 років) перебування й діяльности в таборах. Там постала повноцінна спільнота - громада, яка у великій мірі стала самодостатньою і самодіяльною на різних відтиках - релігійному, культурно-освітньому, частково економічному і політичному і навіть спортивному. Очевидно, це сталося завдяки опіці ( матеріяльній і леґальній) західних аліянтів і міжнародних чинників. Але також завдяки власній динаміці, самоорганізації і колективному інстинктові самозбереження, як і продовження тих вартостей, задля яких ця спільнота залишила рідні землі. Інтенсивна діяльність і досягнення цієї громади продовжувалися і після переселення до нових країн в Півн. Америці, Австралії і Півд. Америці. Замітно, що суспільна модель громадських організацій та активности таборового періоду продовжувалася в нових країнах перебування української діяспори, що доповідач О. Субтельний виразно підкреслив. Some material assistance came from established Ukrainian emigre organizations such as the Ukrainian National Women's League of America (UNWLA), the United Ukrainian American Relief Committee (UUARC), and Ukrainian Catholic Relief Committee. The UNRRA and IRO provided food and shelter as well as most of the medical care and clothing. One critical need, though, was not provided by any organization  jobs. Not all Ukrainian refugees were in the DP camp system. Those that weren't often fared better on their own and remained outside the system (~20-25% of all Ukrainians in Germany, ~30% in Austria). Farmers that were left short-handed after the war offered work, and living in a farmhouse was preferable to the substandard conditions prevalent in the camps. Others had secured city dwellings before the end of the war and simply remained there. Some of those who did not join the camps at first did so eventually if only to qualify for the work abroad programs that were being offered to the DP's. Displaced from the land that Ukrainians had hoped to wrest from the control of Poles, Russians and, finally the Germans, the political divide that was endemic of the freedom fighters in Ukraine was just as prevalent in the camps. No fewer than 12 political parties took root in the camp system, among them OUN-B (Organization of Ukrainian Nationalists  Banderite), OUN-M (Melnykite), and followers of Skoropadsky being the largest in the right wing. The center and left wing groups were weaker with only limited membership. 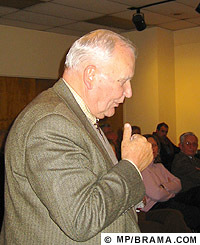 Clashes between the parties usually pitted all other parties collectively against OUN-B, which, according to Prof. Subtelny, had no desire to share control of the camps democratically. Competition between the two major parties OUN-B and OUN-M often led to duplication of effort  if one established a sports club, the other followed suit with one of its own. The mirroring had the peculiar effect of many camp organizations being drawn along political lines. This effect continues to be felt in Diaspora organizations even today. Paradoxically, the disparate political philosophies formed the keystone for Ukrainian unity. The underlying premises of the Ukrainian political parties formed in the camps were first, a total rejection of communism, and second, the nationalistic aspects  the struggle for an independent Ukraine and the formation of a national identity. Their strength was drawn from ideology. As Prof. Subtelny put it, "Ukrainians were committed to their ideology, they even died for it." He observed that most of his students today do not have an ideology; many do not even know what it means. One of the most unique formations within the camp system was the school system set up by and for Ukrainians, and accomplished completely without assistance from UNRRA. 1500 Ukrainian educators, a "surfeit" of professional teachers, found themselves in the post-war free zones. Beginning with the kindergartens of which a total of 70 were created, the system grew to include 102 elementary schools, 30 high schools, 43 trade schools, and 2 universities. In the lecture, Prof. Subtelny underscored three major fears that challenged the Ukrainians: repatriation, camp screenings, and insecurity about the future. Fear of repatriation by Soviet forces banded Ukrainians together at the outset immediately after the war. Camp screenings conducted by UNRRA in order to ferret out Nazi collaborators, war criminals and others with questionable status caused a great deal of concern. Apprehension about an uncertain future was a major source of anxiety. Demoralization was another critical factor affecting disposition of the DP's. Although most camp residents were kept occupied with a variety of organizational activities, there were no real jobs and no way to earn a living. The DP's, completely reliant for their survival on the care provided by the IRO and UNRRA, had grown accustomed to getting "something for nothing." An active black market in contraband flourished at the camps. Political conflicts were often violent. Pettiness abounded over rations and space allotted in the shelters. Isolation from the outside world, deliberate in part to prevent assimilation, was often the cause of despair. With the exception of politically motivated cases, crime was minimal in the camps. Minor theft was common, but kept relatively well controlled. The first camps were organized at the end of WWII in Europe, May 8, 1945. By the end of 1947, the first emigrations were taking place. Starting with offers of work in Belgian mines, subsequent work programs attracted Ukrainians to England, Canada, and parts of South America. The United States opened its borders with the Displaced Persons Act. In many cases, the departure from Germany or Austria led to a transit country. For example, the DP's might have gone to England and later moved on to the United States. By 1949 approximately 80 to 85 thousand made their way to the U.S., and 40 thousand to Canada. The camps were finally eliminated in the mid-1950s (Encyclopedia of Ukraine, 1985). When opportunities arose for moving abroad, the organizations that had formed in the DP camps devised what Prof. Subtelny termed an "impressive trick" to move with the immigrants. They drafted detailed plans for transferring their respective infrastructures including leadership and establishing of new central headquarters. Ukrainians, in other words, came to the new world "pre-organized"  a phenomenon never before observed in any culture. Orest Subtelny, Professor of History and Political Science, York University, is the author of Ukraine: A History, (1988, 2nd ed. 1992), and Ukrainians in North America, (1991).